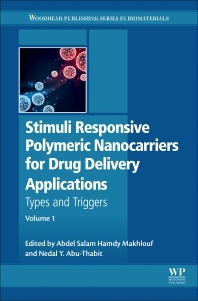 Stimuli Responsive Polymeric Nanocarriers for Drug Delivery Applications, Volume One: Types and Triggers discusses, in detail, the recent trends in designing biodegradable and biocompatible single-responsive polymers and nanoparticles for safe drug delivery. Focusing on the most advanced materials and technologies, evaluation methods, and advanced synthesis techniques stimuli-responsive polymers, the book is an essential reference for scientists with an interest in drug delivery vehicles. Sections focus on innovation, development and the increased global demand for biodegradable and biocompatible responsive polymers and nanoparticles for safe drug delivery. Dr. Abdel Salam Hamdy Makhlouf is a Professor of Materials Science and Technology in the Central Metallurgical Research and Development Institute, and a Consultant and Expert Reviewer for several international companies, funding agencies and universities, and Advisor Editor for Elsevier, USA. He has won numerous national and international prestigious awards including Humboldt Research Award for Experienced Scientists at Max Planck Institute, Germany, Fulbright Visiting Scholar, NSF Fellow, and Dept. of Energy Fellow, USA, Belgian Federal Science Research Fellowship, Arab Youth Excellence Award in Innovation, Shoman Award in Engineering Science, National Prize of Egypt in Advanced Science and Technology, Egyptian Prize of Excellence in Surface Technology and Corrosion, Egyptian Prize of Excellence and Innovation in Materials Science and their Applications 2009, and An-Najah Prize for Research. Dr. Makhlouf is the editor of 13 books, 20 book chapters and over 180 articles. He is Senior Editor of Insciences Journal, Nanotechnology Section. He supervised and graduated 10 PhD and Master’s students, and 3 postdoctoral fellows. He is also a member of the European Science Foundation College of Expert Reviewers, an Expert Evaluator for the EU’s FP7, expert for the German Ministry of Education and Research, reviewer for the German Academic Exchange Service, and expert for the German Aerospace Center. He is a reviewer and panelist for the NSF programs: MME, MEP, and CREST, and a reviewer for the US Fulbright Commission, the Qatar Foundation, the Kuwait Foundation, and the National Centre of Science and Technology Evaluation, Kazakhstan. Dr. Nedal Abu-Thabit holds a Ph.D. in chemistry with specialization in polymer chemistry. Currently, Dr. Nedal is an associate professor in the Chemical & Process Engineering Technology department at Jubail Industrial College. Since 2013, he holds the position of the Program Director for Polymer Engineering Technology major. Dr. Nedal has published more than 20 research articles and reviews in refereed journals, 5 book chapters and 2 patents. His research interests in the areas of polymer synthesis, polymer post-functionalization, synthesis of functional polyelectrolytes for fuel cells applications, water sterilization using nanomaterials, synthesis of electrically conducting polymers for sensing applications, preparation of conductive hydrogels and conductive textiles; and isolation of biopolymers from natural sources. In addition, Dr. Nedal has contributed with many articles in the area of educational polymer chemistry.